Drink Quality Control: A Ride-Along with Other Half Brewing Co.
Quality Control: A Ride-Along with Other Half Brewing Co.
We hit the streets with Brooklyn's most exciting new brewery to find out why it chooses to self-distribute its beers in NYC, and how the crew pulls it off week after week. Other Half is a tiny new brewery in Brooklyn, secreted away in an industrial swathe of Carroll Gardens. The soaring Gowanus Expressway looms nearby, and there’s a raggedy McDonald’s drive-thru across the street. When co-owners Matt Monahan and Sam Richardson began brewing there in late 2013, they improbably became the first new brewery to open in Brooklyn in nearly a decade (the last was Sixpoint, which still maintain its HQ in nearby Red Hook). Now nearly a year in, Other Half has become the darling of local craft-beer cognoscenti, with limited output and consistent quality breeding a cultish “if you see it, order it” mentality among fans. The brewery’s fruity, floral IPAs and well-balanced pale ales are minted in the style of West Coast gold standards, and its experimental program of farmhouse ales, barrel-aged beers, and funky sours has raised the bar for progressive brewing in NYC. The team recently bottled its first beer—a 7.8%-ABV, chardonnay barrel-aged saison called Veldrijden Love—and it will soon begin canning select offerings, starting with four-pack tallboys of the dank and sticky Green Diamonds imperial IPA. Simply put, Other Half is killing it right now. Despite some early setbacks (the brewery nearly went bankrupt while waiting more than six months for National Grid to install a lousy gas meter), Richardson and Monahan have discovered that there are some perks of running a brewery in red tape-littered New York City. One of the most advantageous of those is a self-distribution provision that allows small breweries like Other Half to bypass the middle branch of the three-tiered producer-distributor-retailer system and sell beer directly bars, restaurants, and shops. We want to make sure that the quality of the beer comes first and that we don’t get in over our heads for the sake of size. So three days a week, Monahan does just that. 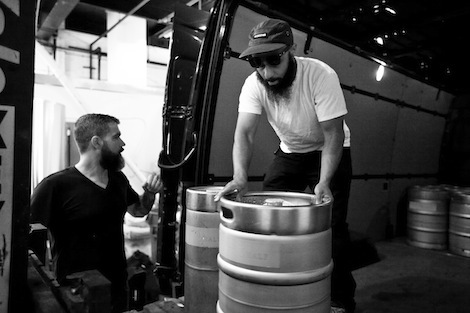 He loads up Other Half’s zippy navy blue-and-hot pink cargo van with up to 40 kegs of fresh beer and hits the streets, hand-delivering beer to bars and restaurants throughout Manhattan, Queens, and Brooklyn. He says maintaining control of distribution also allows Other Half to tailor the beers to the best accounts—ones he trusts will represent and pour the beer properly. 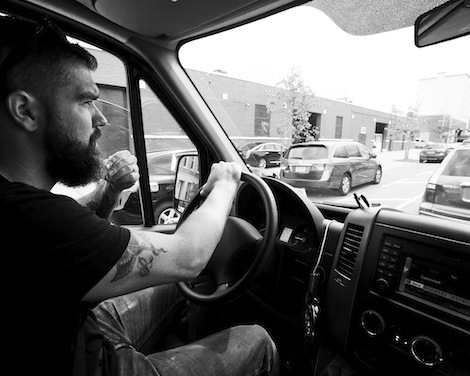 We wanted to see first-hand how the self-distribution process works, so recently we saddled up and rode along with Monahan and Other Half’s tasting room bartender Anthony Finley as they dropped off beer at bars and restaurants from the Bowery, to Astoria, to Ditmas Park. Here’s what we saw. 1. 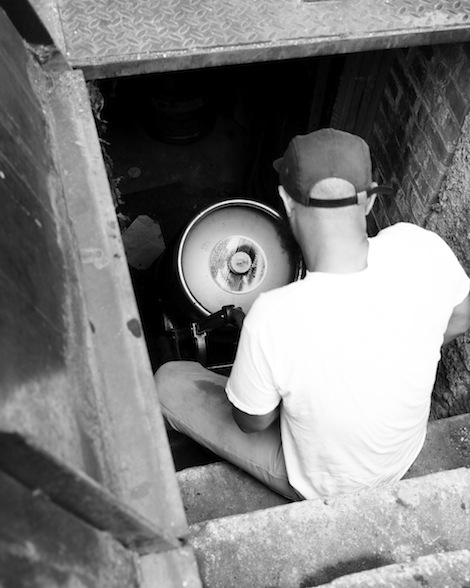 It’s around 11AM on a Thursday morning when Monahan begins loading kegs from the walk-in cooler onto a hand truck at his brewery in Carroll Gardens. The barrels in the background are filled with beer destined for bottling. 2. 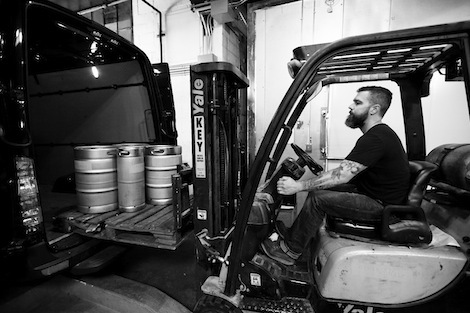 Monahan uses a forklift to lift palates of kegs into Other Half’s cargo delivery van. 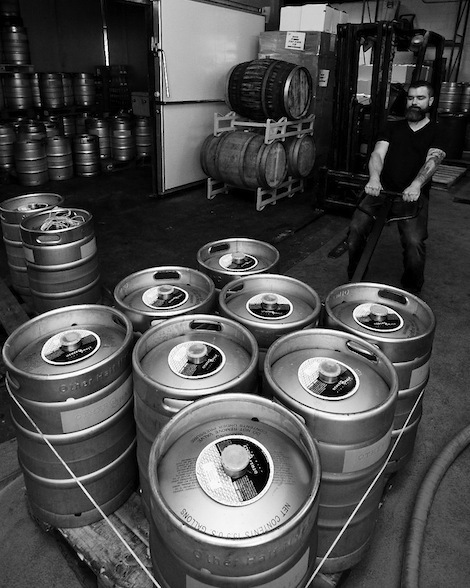 These kegs are destined for bars and restaurants in Manhattan, Queens, and Brooklyn. 4. The first stop is at Dinosaur Bar-B-Que on Union Street in Park Slope. 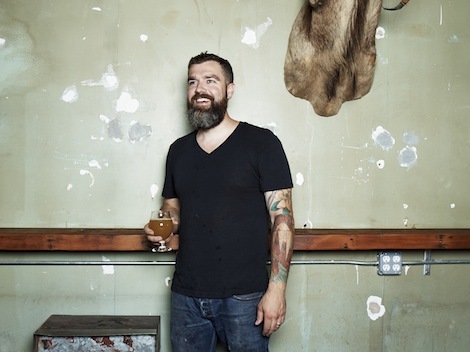 “We get to choose really great bars and restaurants that really love the beers they pour,” says Monahan. 5. 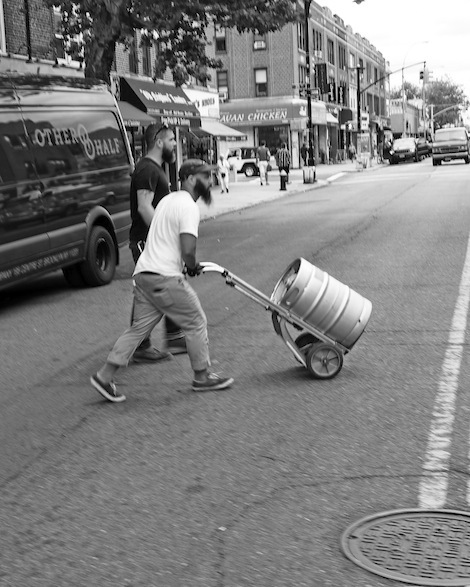 Finley wheels a keg of Other Half’s flagship IPA across Broadway to Astoria Bier & Cheese in Queens. “We weren’t planning to go all the way out to Astoria today,” says Monahan, “but they have an emergency and need beer.” Deliveries are usually limited to one or two boroughs per day, but we hit up three, including Manhattan, Queens, and Brooklyn, on the day that we rode along. 6. One of the pains of self-delivery: The city’s ubiquitous, near-vertical cellar steps—this set is at Sycamore, a flower shop and bar in Ditmas Park. 7. Another hazard of self-distributing in the city is that breweries have to purchase and keep track of their own kegs. 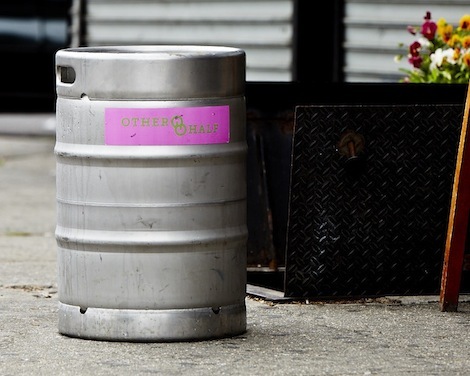 When we stopped by Double Windsor in Brooklyn, Monahan learned that one of his empty kegs had been stolen the previous day, allegedly by a driver for SKI Distributors, one of the city’s largest beer distributors. Monahan was peeved. “Now I gotta tell every motherfucking account that SKI is stealing kegs,” he told me. Monahan says that since Other Half opened nearly nine months ago, about a dozen empty kegs have been stolen from his accounts throughout the city (they cost $140 each). He claims SKI’s drivers take the kegs and sell them to the scrap yard for about $50 a pop. (It’s technically illegal for a scrap yard to take an empty keg without documentation.) When he called SKI’s headquarter to complain, the warehouse manager hung up on him. Monahan considered filing a police report for petty theft before we left. 8. After a quick lunch at Krupa Grocery, we headed back to Other’s Half’s tasting room near the Gowanus Canal to prepare for its first Thursday night opening. (The tasting room is open for pints and growler fills Thursday through Sunday.) Monahan was in much better spirits after a glass of Small Green Everything, a session IPA. Visit the tasting room! Other Half is located at 195 Centre St., Carroll Gardens, Brooklyn (347-987-3527, otherhalfbrewing.com). Tasting room hours are Thursday andFriday 5pm–10pm, Saturday noon–10pm, Sunday noon–6pm.